It’s two days after #WCRaleigh 2017, so I thought it’d be fun to get some Words Pressed about my experience this year as a first-time Lead Organizer. A lot has changed since the time I was an accidental organizer in 2015. Chris Lema unsurprisingly made for a fantastic Keynote speaker the first day. It set a tone for the conference that was helpful, upbeat, and welcoming. While we’ve had opening remarks in the past, this was the first time we gathered the entire conference in one room. In years past, people skipped opening remarks to get good seats in the various tracks. This year, we packed everyone into one room to hear from Chris, and it set up the conference “vibe” in a way we weren’t able to last year. Major win. Cory Miller provided an equally good “opener” on Sunday morning, and that’s easily the most heavily attended 9:30 AM talk the day after a (fantastic) after party in WordCamp Raleigh history. I may have been working on fewer than 4 hours of sleep, but Cory made me tear up with his personal, heartfelt, and crucially important honesty about “Managing Your Iceberg.” It’s a talk I hope he never stops giving. The food (I had the Taco bar) was very good again this year, and the lines were much shorter than last year. This was a combination of the fortuitous staggered end times of the talks in each session immediately preceding the lunch break along with some great planning by the On Campus Dining after last year’s long lines. The workshops were also a hit. Special thanks to Micah, Tony, and Doug for leading those! All of the talks I got a chance to see part or all of were well-attended, engaging, and helpful. We had talks from first-time WordCampers that were great, seasoned presenters that were great, and all range in between, also great. The addition of drink tickets to the after party meant we had better attendance there this year than in years past, so that was great. Finally, I LOVE the new Raleigh Wapuu and the t-shirt design this year. We had some venue issues. The most noticeable was the AC was out for the first hour or so, which made for a HOT keynote. Also, the doors were never fully unlocked. This is our fault as organizers, and I felt terrible about it. I was on the phone with the Emergency after-hours HVAC people for most of Chris Lema’s talk. Better tech prep for the overflow room. The keynote room was not quite large enough for the full capacity, and we planned on live-streaming it to the next room, but had some last minute glitches with that, which made for a stressful start. Included in that stressful start was my leaving my notes for opening remarks in the other room, so I did a bad job of properly thanking sponsors by name, as well as introducing Chris Lema appropriately. Also omitted from opening remarks was any mention of the Code of Conduct. That’s inexcusable, and it won’t happen next year. While I was not made aware of any violations of the Code of Conduct, it’s still something that must be mentioned during the conference. The only other glaring issue was that the workshop room did not have power outlets, meaning that if you brought your laptop without a full charge, you were out of luck on actually workshopping. That’s a pretty glaring party foul, and we’ll do better about that next year. 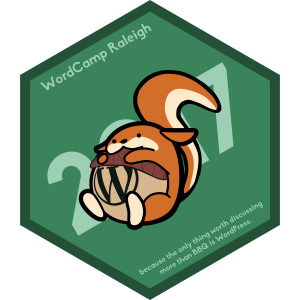 All told, I am very proud of this year’s WordCamp Raleigh, and we’ve gotten overwhelmingly positive feedback about the conference since it ended. WordCamp Raleigh 2017: The Lead Organizer Recap #WCRaleigh Tweet this Moving the conference back to the late spring where we miss both NCAA Basketball and Football seasons was a win, even though it meant a shortened planning cycle. I am indebted to Michael, Steve, Lisa, Allen, Sharon, Jen (my fellow organizers) as well as the many volunteers, without which this conference would certainly not have happened.